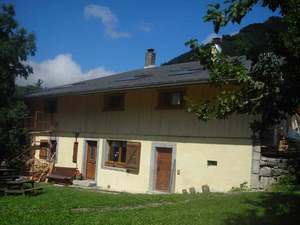 At the heart of a small mountain village, we welcome you in an old farmhouse renovated by us.4 bedrooms with private health with a family suite and a room suitable for people with reduced mobility. On Highway 40, take exit "Vallée Verte", then "Boege", "Habère Poche" then "Bellevaux." Before "Bellevaux" take direction "La Chevrerie-Lac Vallon." 4 km, after the sawmill take the small road to the left is the second house.